Happy Tuesday! I’m here to play along with the sneak peeks for the Taylored Expressions June Release. Everything you see today will be available for purchase on Thursday morning at 8 am PST. 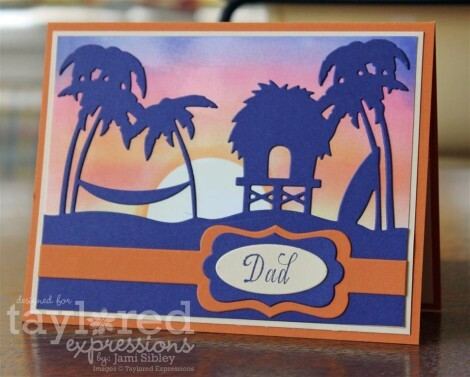 I have two cards to share with you today and both of them take us to the beach! First up is a set I requested – Ride the Wave. I have always loved the style of You’re My Hero and have used it for a lot of “guy cards”. Being a SoCal girl and having a boss who is a surfer has made me yearn for a surf set in the same style as You’re My Hero, so Nancy McKinney obliged with Ride the Wave. 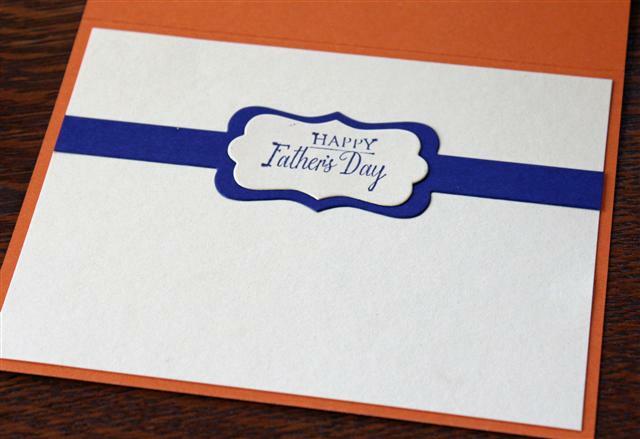 This set is all aboout pure stamping – solid stamping – no coloring needed. My card is super simple (which I think is perfect for a guy!) Oh and there are surfboards too…and a matching die for them! I used SU inks and cardstock (Cool Caribbean, Wild Wasabi, Night of Navy, Bermuda Bay, Real Red) and some American Crafts red glitter tape for a little sizzle. It just doesn’t get simpler than that. My second card is all about Taylored Dies, specifically the new Beach Border Die along with the Band It Die released last month. This Beach Border was Wanda’s brainchild and came up in a discussion around the dinner table with the team at CHA. When I opened my box from TE this month, the very first thing I had to do was try out this fabulous die. I’m looking forward to playing with it lots more. 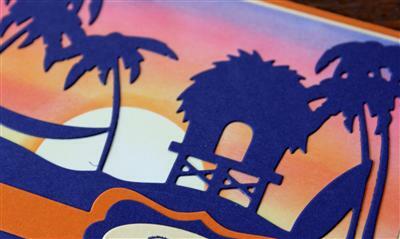 The beach border was cut out of deep purple (SU Concorde Crush) cardstock. One of the cool things about this die is that it doesn’t have a bottom – so you can make the beach as deep or shallow as you like. I used the Band It Die to feature the sentiment is from the Greetings For Him stamp set. The sunset was sponged onto glossy cardstock. First I looked up images of beach sunsets on Google image. There are so many different color combos for beautiful sunsets. 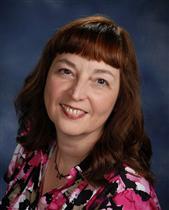 I chose a picture with yellows and oranges and pinks, with an edging of purple. So pretty! I took some pictures of the sponging process along the way. Let me know if you’re interested in seeing this process. I can post the pictures if you are. I really love the way this turned out and it’s so easy! There’s so much to see today. I know you won’t want to miss a thing. 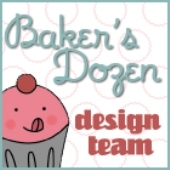 Let’s see what the Baker’s Dozen has cooked up! Thanks so much for stopping by. I hope you are dreaming of sunny shores! We are getting ready for a vacation in Malibu and I can hardly wait!! These are great Jami! I really like the way you layered the wave stamps in the first card and the blue and orange combo in the second card really pops! 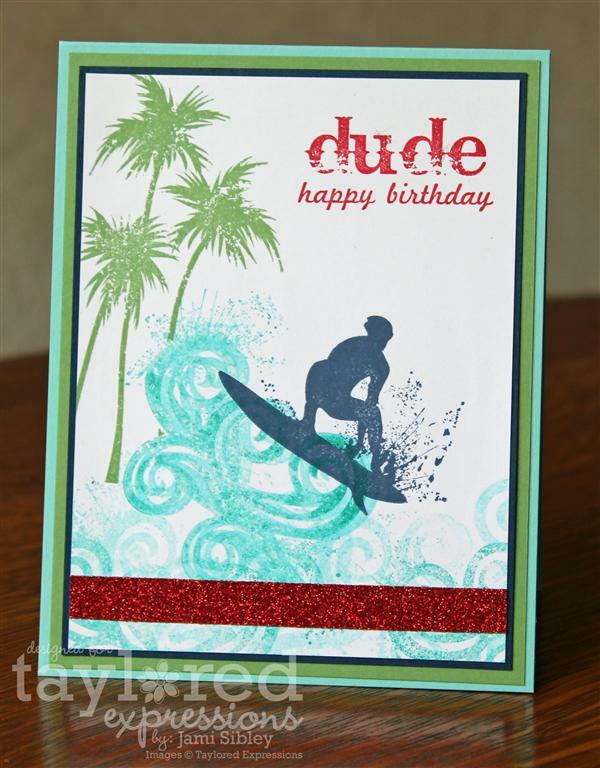 Your surfer looks fearless riding that big wave, Jami…what an awesome card for a *dude* and I absolutely love your second card with the gorgeous colors and the beautiful setting sun you created…WOW!!! Love how you created your surfer scene, Jami, and your beach border card is stunning with the sunset! Love how the band it die fits so perfectly on the outside and inside! Love these cards Jami! That first surfing one is SOOO awesome! Love the way he is riding the wave! And I adore the second peaceful sunset scene you created!! Awesome awesome!! Big hugs! Love these, Jami! The layered waves and the surfer is just fabulous! And the sunset with the beach border is simply breathtaking! Beautiful sunset and I love the navy die cut.